We believe in financial planning – because it works. It is not an event, but rather a deliberate and continuous process with benefits that accrue over time as the rest of life is happening. Without it, financial well-being becomes increasingly uncertain and exposed to a growing risk of financial failure. Our approach is comprehensive, customized and integrated. We delve deeply into our clients’ financial lives and address a broad range of planning-related subject matter in order to develop and implement individualized strategies designed to maximize wealth accumulation and financial security. As with most aspects of life, the financial planning process is one of continuous evolution. As circumstances change, planning strategies evolve through a process of ongoing review and refinement. 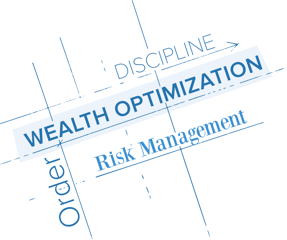 For over 25 years, we have been committed to bringing order, discipline, risk management and wealth optimization to the lives of our clients. The relationships we build often span decades and cross multiple generations. Our approach is best suited for those who tend to be responsible, disciplined people of high integrity who value these same traits and want to work with an organization they can trust completely.